When my friend was talking about testing soul contact åhe mentioned the possibility of using it to find a mate but noted the difficulty in proving that it as the real thing no matter how it worked out. He suggested a better test would be questions to which we could discover the true answer and prove something extra sensory was happening. The trouble is that the soul will only give you answers that you cannot discover with your own intellect. Most decisions in life it leaves up to you unless you reach a place on the path of life where it is important to your life’s purpose that you choose correctly. It is not important that the seeker prove soul contact to others but fortunately, he can prove it to himself.to himself. As I said in my last post the presence of the soul is very familiar because it is linked to our Source and once experienced in fullness there is no doubt. There are many doubts though on the way to fullness. The mention of marriage caused me to reflect on significant guidance through the s soul that I have received in my relationships. I was pretty much born with the feeling that there was a certain person I was to find as a marriage partner and looked forward to the day when I would find her. Before that happened I was strongly attracted to three different females that I wanted to marry. On the first two I received a message that I wasn’t supposed to marry them and I reluctantly accepted. The third one however, seemed at the time to be just what I was looking for and I fell for her deeply. I didn’t even ask whether or not she was the one because I didn’t want another “no” answer. Then as our relationship was about to reach the point of no return the soul stepped in and gave me a definite no. It was so strong that I was affected physically. Even so, I didn’t want the answer to be true and continued seeing her for a few more weeks thinking hat maybe the soul would change its mind. It didn’t and gave me two more warnings to not marry this girl. There was nothing wrong with her and much that was right, but there was some reason that she was not in my life’s plan. Breaking it off with her took all my strength and to make it worse she did not take it well. Then a short time later the soul did tell me who the person was that I was supposed to marry. It was a lady I had met in England that was at that time merely a pen pal. It seemed crazy, but the soul had never had always been right before so I dropped everything and took off to England to check her out. After arriving I started dating her and discovered that we had almost nothing in common, except we were both members of the LDS church at the time. We disagreed on almost everything and I could see that any marriage to her would be extremely difficult. I rationalized my answer thinking that perhaps marrying her was something I could do, but didn’t have to do. I decided to cut my losses and go home. I explained to her that we were not well matched and I was going to leave in a few days. She explained that she had received a previous answer from God that we were supposed to be mates but wanted to check one more time. She wanted to fast and pray about it for three days and the get together with me again. To this I agreed. That was somewhat disturbing, but it didn’t convince me to marry her. I replied that it may be alright with God, but it’s not all right with me. I told her that I still thought a marriage to her would be a mistake and I was planning on leaving in a few days. My soul must have thought it had not made itself clear to me so over the next few days It gave me a clear message with great power as well as proof that she was supposed to be my wife. I was free to choose but the choice was difficult. It was to go along with a direction from my Source, even though it did not make sense, or go against it and perhaps not accomplish what I am supposed to do in this life. This higher guidance had never let me down before so I went ahead and married her. I thought that perhaps by some miracle the marriage could work. Then the day after the marriage I received another revelation. The marriage was going to end in divorce, but in the meantime I was to do all in my power to make it work. This revelation killed off the last glimmer of hope for success I had and sent me into deep reflection. Why would God guide direct me to take such a step that would only lead to disaster? I prayed for an answer, but nothing came. I continued to petition God for an answer unceasingly, but nothing came. It was as if there was no Higher Self, no Soul, no Spirit and no God for the next five years, while all the while the marriage was even more difficult than I had imagined. Up until this point in my life every impression I had received from the soul made sense and proved to be accurate. It made no sense to me that I was directed to reject what I thought was my ideal match and marry someone who was as far from a match as I could have conjured up in my imagination. Several years earlier I created a list of around 16 qualities that I was looking for in a mate. The last one the soul told me not to marry seemed to have them all. The one the soul told me to marry had only one and that was she was a member of the LDS church. At that time this was an important point on my list. In the past, when the soul told me to do something that didn’t seem to make sense I fond out in short order the reason and that the guidance was correct. This time it was different. The direction made no sense to me and years passed and no answer was forthcoming, even though I pleaded with God incessantly for an answer. Finally, after five years the answer came quite unexpectedly. The details are private but the end result was this. I learned that the doctrines of reincarnation and karma were true and I had powerful karma with my wife from a past life that I had to work out. And why did my soul wait for five years of pleading on my part to reveal this to me? Because I was not ready to receive the answer until I went through the process. Before this answer came I really took the church seriously and one of its teachings was that there is only one life and that reincarnation is the doctrine of the devil. Accepting that there was reincarnation would put me at odds with many orthodox teachings of the church and make it impossible to stay in the church as a good supporting member. In the mind of a good Mormon, to accept reincarnation is to risk his eternal salvation. My soul was silent for five years because it took five years of contemplation on my part to be ready to receive what it had to say. After several years word got out to the authorities that I had some strange beliefs so they had called me to trial and excommunicated me. Now that I was a non member the marriage was more difficult than ever for the one thing we had in common had evaporated. My wife now saw me as one under the influence of Satan. I would have liked to have bolted but my soul told me to continue in the marriage. Very reluctantly, I stayed in the marriage. Altogether the union lasted twelve years and during this period I was quite dissatisfied and did not fully accept my situation. How long I would have to stay in a difficult marriage I did not know. Finally, in the twelfth year I had an epiphany. I thought to myself of how I had obeyed the commandment to marry and stay with my first wife, but I never really accepted it. What good was it doing for me to inwardly complain about my situation? I thought to myself that I am here in this situation and if I am to fulfill whatever I came here to do then I must accept it. A that point something happened to expand my consciousness and I just made the decision to totally accept where I was on the path of life and cease any resistance in word, thought or deed. I was amazed how liberating this was for me and found myself at peace more than at any time in my life. It even had an affect on my wife and our relationship seemed to improve a little, though it was still d9fficult. I thought this was an odd time to receive this instruction. In the past I would have been thrilled to move on but in my new state of mind I found I that my peace and happiness was not determine by outward circumstances. I was amazed that I seemed to not care if I moved on or not at this point. Even so, this revelation got me to thinking. If I was to move on where or who was I supposed to move on to? Perhaps there was another person from my past lives I was supposed to find and marry. I contemplated on who that may be and came up with a name and after reviewing my current life and probable karma I figured that I should be meeting her soon. It wasn’t long before I met this person with whom I had a past life connection. One day my nephew Curtis called me and told me that our friend Wayne had a new girlfriend and wanted us to meet her. We met at lunch at the Sizzler and had a pleasant conversation which drifted toward philosophy and spiritual principles. She was a nice lady and attractive, but nothing hit me over the head at that time. The next day Wayne called me up and told me that his girlfriend wanted me to call her – that she was interested in some of my thoughts. I asked him if he was sure that was all right with him and he said it was no problem. I called her up and we talked for over an hour and by the time I put the phone down I had confirmation through my soul that this was the one I was expecting to meet. The circumstances were awkward though for I was married and she was dating my good friend. She wanted me to come to her place and teach her. Again Wayne was fine with this for he trusted me. I visited her on three occasions and answered many spiritual questions she had. As I was saying goodbye on the third visit a quantum of spiritual energy descended on us both and as I drove away my soul delivered to me a powerful message that this was the next person I was supposed to marry and I was supposed to pursue her. I saw her again a couple days later and the first thing she asked me was the meaning of the powerful spiritual energy that descended on us both. I told her that there was a link between us from past lives. I then asked her if she would agree to be regressed so we could retrieve some memories and verify who she was. I knew the name I was looking for from our past and was interested in seeing what she would come up with. Fortunately, she was a good subject for regression and amazingly she went back to the past life that I anticipated. When I asked what her name was in that life she gave me the name I was looking for. Not only that but she gave me pieces of information from that period that she couldn’t have known, but was historically accurate. I later took her back to a number of past lives and found we had a history of varied relationships. After this I realized that this was the one with whom I was supposed to move on. I could see why for I had been given an important spiritual mission to accomplish and she would support my endeavors whereas my current wife opposed them. Shortly thereafter I approached my friend, Wayne and told him about the experience. He told me that he had felt sorry for me over the years with such a difficult marriage and he’d be willing to give her up for me. What a great friend, I thought to myself. I now had a firm direction through my soul to move on to a new relationship, but the decision was not that easy. Breaking off from a spouse, even in a difficult relationship, is difficult enough, but the effect on the kids makes it supremely difficult. I couldn’t have done it unless I knew for an absolute surety that this was what I was supposed to do for I could not complete my mission in my current marriage. I got a divorce and remarried. We were happy together for the next three years. We started a spiritual group and she loved and supported the teachings I gave out. She was so supportive that her main goal was to make enough money to support us so I could do spiritual work full time. Then about the fourth year that dream came true and she received a big promotion at her company at almost double her salary. That was the worst thing that ever happened to our relationship. From that point on her support for the spiritual work diminished and her desire to live the normal life increased. She seemed to resent being the main wage earner. Artie was a lady that was attending my classes. I never dreamed of moving on for the third time, but now I saw the possibility. During the next few months I did everything possible to revive our relationship, but it was as if her consciousness had made a shift and there was nothing I could do to move it back. My teachings that she initially loved and was drawn to had now become a major point of friction. As time passed our relationship suffered greater stress. At one point she just took off to Sun Valley for a couple days and I didn’t know where she was. When she returned she told me she had concerns that I may be turning into a negative cult leader like the famous Jim Jones who famously had his group drink the deadly Kool-Aid. How she ever developed a concern like this really baffled me as she had previously had a powerful witness about our path together. I asked her to have a prayer with me on the subject. We did this and a peace descended on both of us and at least she didn’t bring this up again. The problem seemed to be that she was looking or problems rather than solutions. From the numerous lifetimes to which I regressed her we found we had a number of close relationships that always seemed to get frustrated in some way and it was almost like she had a code in her to repeat that. The difference with this life was there was nothing external in our way. It seemed that her mind just accepted that it was too good to be true that we could live happily ever after in this life, because it did not happen in previous lives. Then came the day that we had the biggest fight of our marriage. It occurred just before I was to teach a class to the spiritual group. She didn’t go with me that night so I arrived alone. I hadn’t had much time to prepare a lesson and had a few notes scribbled on a piece of paper. I wasn’t exactly in the mood to come up with something inspiring. As I got up in front of the class I looked upon the audience and Artie caught my attention. She was looking at me with eyes of anticipation, as if she was expecting me to deliver something wonderful. There was something magical about that look and I realized that the rough lesson I had prepared would not deliver what was needed. I immediately trashed my notes and searched my mind for something that would be more inspiring. As I contemplated the phrase “Divine Carelessness” came into my mind and I spoke on that. It was more of a speech than a class as the words just flowed seamlessly and I think to this day that it was the best speech I have ever given. Unfortunately, it was not recorded. During the presentation I felt a oneness with the audience, especially with Artie, for whenever I looked in her direction I saw approval in her eyes. When I finished I felt a great peace and contentment though somewhat physically drained. Afterwards, I noticed Artie and an elderly lady sitting on a couch with a space between them. I flopped myself between them and put my right arm around Artie and my left around the other lady. This just seemed to be the friendly thing to do at the time. At that instance something magical happened. It was as if our souls cooperated on a higher level and filled us both with spiritual fire. It was as if Artie and I were the only two beings in the universe and as if the other lady as well as the rest of the group were not even there. When soul contact happens with two or more people you both know that the feeling is shared. Nothing has to be spoken. I must have sat the between the two ladies for 15 minutes and neither Artie or I said a word to each other. We both felt like we could bask in the divine essence forever. Finally when it became socially awkward to stay there any longer I rose up and mingled with several others. Then I asked her if she felt anything unusual when we were sitting next to each other. She answered that she did indeed feel something amazing that had never happened to her before. “What does it mean?” she asked. I paused as I realize the possible results of telling her the whole story. Even so, I didn’t see any other path so I told her what happened and that the same spirit that surrounded us when we fell in love happened to me and Artie. I told her that if our marriage could not work then I was supposed to move on and marry Artie. Then I told her that I was still willing to give our marriage another chance if she was willing to work at it. She replied that she thought the guidance I had received was correct and that Artie was a better match for me than her. She said she was sure. During the next few days she was extremely quiet and reserved. I think she regretted her decision and was considering asking me to stay, but couldn’t bring herself to do it. These last few days together were also difficult for me as this was a woman I had given my heart to with the idea of loving her forever. This was a marriage that was supposed to work, but didn’t. I don’t know if I would have had the strength to leave her if she had asked me to stay. But if I knew what was good for me I would move on one more time. At that time our spiritual group was having weekly meetings. The next one came up a couple days after the decision to leave my wife. Artie came to all the meetings and I was sure she would attend. I had full confidence because of the go-ahead from the soul that I could win her heart and that she would be my next mate, hopefully the last one in this life. One thing that was in my favor was that she had just separated from her husband a week or two previously. This timing seemed to work in my favor. The meeting progressed as normal and afterwards I again asked Artie if I could talk to her privately. She agreed and we walked a distance into an isolated park. I brazenly told her that the feeling that had descended on us the week before was a message that we were supposed to be together and that I was leaving my wife which would open the door for us to be married. This startled her and she started giving me a dozen reasons why this was moving way too fast as she had barely separated from her husband and her daughter wanted to spend some alone time with her. As she was giving me all these reasons to go slow I felt that I needed to do something. I grabbed her, looked into her eyes, told her I loved her and kissed her. I can’t really say the soul told me to do that, but the move seemed to be inspired as all resistance seem to cease. We spent the next couple hours together talking and getting to know each other in a way you cannot do as a student-teacher in a group setting. By the time we parted I was pretty sure that she felt the same way I did about moving ahead. That was roughly our first date. I moved out and stayed temporarily with some friends. We saw each other the next few days as much as possible and things seem to progress well. Then one day I called her up to arrange to get together again. There was something in the tone of her voice that caused me concern. I soon found out why. Here is the conversation to the best of my recollection. Artie: “My daughter seems to think you are an evil cult leader who could lead me to some disastrous end. She called her father (Artie’s ex husband in California) and described you in such a way that he seems concerned for her well being and is threatening to take steps to get custody and my daughter is threatening to go live with him. On top of that she called my mother in California and portrayed you so sinisterly that she is afraid for my life and flying in at the first possible moment. “I feel peace,” she said. “I want the peace!” she said decisively. At that point she committed to go forward with me despite the voices telling her otherwise. I am happy to say that she has stayed committed to our relationship from that time forward, over 30 years now. After we committed to continuing the relationship we did our best to manage the tempestuous situation. I visited with her mom after she flew in and did my best to convince her that her daughter was safe with me. Artie did her best to convince her ex-husband that there was nothing to be concerned about and I did all I could to befriend her daughter. Her daughter was somewhat glad Artie separated from her current husband as she thought it was going to give her more time to spend with her mom and I greatly interfered with that idea. It took her a while to adjust to me coming into her life but eventually the walls came down and we now consider each other family. Another thing of concern was that Artie’s husband, with whom she had separated, had learned that we had gotten together right after he moved out. He knew that she had been coming to my group meetings and erroneously figured that we must have been having an affair behind his back. I received word that he was threatening to kill me and to watch my back. This made me a little nervous, but there was no other path for me except to move forward. Fortunately he did not act on his feelings. Artie and I both filed for divorce about the same time and had both granted within a day of each other. We applied for a marriage license the day after the divorces were granted. When the clerk saw that we both received divorce papers within a day of the marriage license she thought there must be some error as this didn’t happen every day. Since it was nearing the end of the year we decided to get married on New Year’s day. I figured that would be a good day because this way I would never forget our anniversary. I wanted to make sure this marriage would work so I did an in depth astrology analysis for the favorability of the date and time. We were inclined to get married at the stroke of midnight, 1988, but I calculated that a more favorable time was twenty minutes after that so that was the time we settled on. According to all I could see of the astrological energies at play this time looked as good as any. The marriage was a great new start for our lives, but proved to be a disaster for the group. For the past year Artie was jus a fellow student and other members did not know there was a problem with my marriage. Two things upset them They liked my previous wife and they had difficulty in accepting Artie as the new teacher’s wife. In addition to this there was one female in particular who was attracted to me and did all in her power to get me romantically involved with her. She was somewhat upset that I didn’t yield to her but then when out of the blue I left my wife and married Artie, a fellow student, she seemed quite affected. She found another teacher and did all she could to get the group to shift over to him. From that point on the group was never the same and a few weeks later we had a very explosive meeting where bitter disagreements over trivia surfaced and it was as if the group exploded and disintegrated. Artie was very supportive about starting another group and I would have liked to but I concluded that one of the main causes of failure in my last marriage as well as the group was a lack on earning power on my part. My last marriage went downhill when my wife became the major wage earner and I couldn’t give the group the attention it needed when I had such concerns about earning a living. Since I didn’t charge the group for the classes they we not a source of income. I decided to start an advertising business and work at it until I got ahead and then go back to teaching. I plunged ahead and shortly thereafter Artie quit her job and joined me with the business. For the next ten years I worked about 80 hours a week at the business. During this time I never did anything spiritual, never even had time to read a book, teach a class or even discuss much concerning spiritual principles. We paid the bills, but I wasn’t really getting ahead. Finally, the time came for me to write the book, The Immortal. The question was where was I to find the time? I was already working until 2 AM almost every night. The only solution was to work after two. I then started writing between 2-5 AM each morning and caught a snooze in the office or whenever I had a few minutes. I kept up this schedule for over ten years and produced millions of words that are now available on the internet. Now at the age of 73 I still service a few old customers but have a lot more time to study, write and attempt to follow the spiritual direction of my soul and fulfill my mission, which is another story. Some may wonder why my first two marriages failed if I was truly guided by a higher contact. The answer is simple. The soul is not so interested in guiding us toward a contented life as it is toward an increase of learning or situations where productive spiritual work can be accomplished. The day after I married my first wife I was told that it would end in divorce. This was extremely confusing to me at the time, but now I see the picture clearly it all makes sense. I see many valuable lessons that I learned. I cannot share then all but here are three. First, the situation forced me to think out of the box. 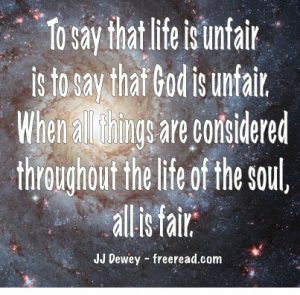 If there were just one life it would be unfair for God to lead me into an unhappy marriage. If I had a happy marriage in the church I may have been content there and never made the spiritual discoveries that are in the millions of words I have written. Secondly, it taught me to look upon the soul instead of the personality. My first wife had a personality much different than my own and to live with her in any degree of peace I had to look upon her soul. The third was that I learned to remain at peace in circumstances that were very stormy and awkward. These lessons were important, but the main reason was a past life connection and karma that needed to be worked out. I was guided to my second wife also to work out some karma and or the fact that if she stayed faithful to her own soul she would be a big help in freeing my hands to do the spiritual work I signed up for before I was born. Because of free will not even our Higher Self knows what all of our decisions will be. She was a big help the first three years of our marriage, but the last year her free will took her in the opposite direction. That marriage was not designed to teach me lessons, but to empower a spiritual work. Since it did not work out my soul provided me with another. Even so, the failure of my second marriage cost the spiritual work of which I am a part a setback of over ten years as well as the disintegration of our group. Hopefully this account will aid the reader in understanding how the power of the soul can work in our lives. It does not give us data on demand but will guide us toward paths where we can learn and be of service to our fellow men and women. All the normal life decisions it leaves up to us. Most marriages are left up to the individual. Often if one has a choice between two people as mates it is not that important which one you chose. If it is and there is something important to learn or work out, and you are willing to listen, then your soul will guide you. The path of the soul may be bumpy at times but the end will be good and the seeker would not trade the lessons learned for anything.